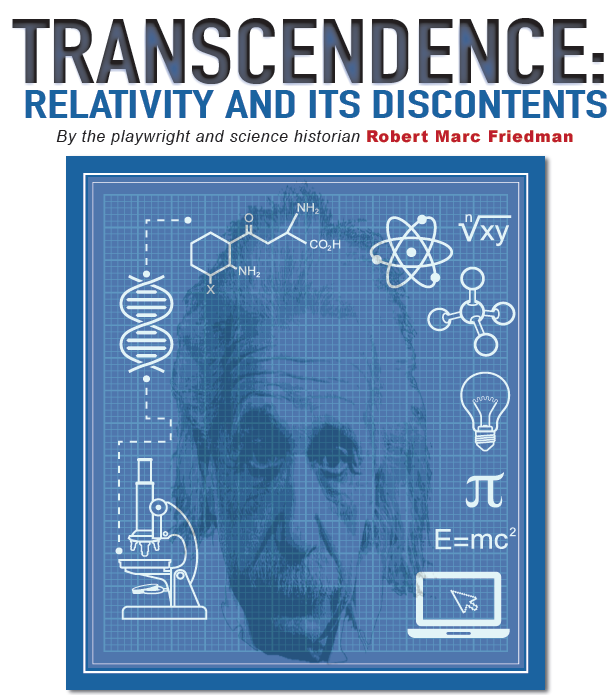 This academic scandal, and the players involved - Einstein, Maxwell Planck, Gullstrand and Carl Wilhelm Oseen - make up the dramatic motion of Robert Marc Friedman's new play Transcendence: Relativity and Its Discontents, which was given a stage reading earlier this month at the APS meeting in Baltimore. On the periphery of the action, first in Prague and then in Berlin, whirls Franz Kafka, the wonderfully tormented Czech, Jewish writer here employed as dramatic foil to Albert. Friedmam's play begins in Stockholm, with Allvar Gullstrand accepting his Nobel Prize in Medicine or Physiology in 1911. With this new clout, Gullstrand, already a member of the Swedish Academy for six years, decides to sit on their council for the Nobel Prize in Physics, despite his background in ophthalmology. Gullstrand then proceeds - in the play, as in history - to leverage his position here to block Einstein, and relativity, from receiving the Nobel. Acting as Gullstrand's dramatic foil is Carl Wilhelm Oseen, a Swedish theoretical physicist who would later become Director of the Nobel Institute for Theoretical Physics in Stockholm. Friedman, Professor of the History of Science at the University of Oslo, was commissioned to write the play by the Max Planck Institute for the History of Science, based in Berlin. He previously penned "Remembering Miss Meitner," a dramatization of the female physicist Lise Meitner's flight from Berlin in 1938 for Stockholm and her subsequent struggle for academic cceptance. "Transcendence" will be performed there in late November this year, as part of the city's celebrations for the one-hundred-year anniversary of Einstein's proposal of the theory of relativity. The setting, on the evening of Sunday, April 4 during the American Physical Society's 2015 April meeting, was that of any staged reading, with the actors dressed in semi-formal attire and seated in a row, scripts perched on music stands. On a table behind them sat two un-shaded lamps whose bases were great metallic spheres - one could easily imagine a purple bolt of electricity jumping and dancing between the bulbs. A coincidence of hospitality, but inadvertently effective minimalist décor, especially given that they framed the actor playing the quantum theorist Maxwell Planck. To his right sat Oseen and Gullstrand; to his left, Einstein and Kafka. The play bounces between these three groups and across Prague, Berlin, and Uppsala, with many of the ostensible interactions between Kafka and Einstein taking place in the German capital following their first chance Prague encounter. Erstwhile, World War I comes and goes, Planck convinces Einstein to leave his professorship in Zurich for one in Berlin at the Royal Prussian Academy of Sciences, and Gullstrand and Oseen spar over the former’s resistance to award Einstein the Nobel Prize for relativity. Of the world's struggle to reconcile the theory of relativity with existing conceptions of the universe, Friedman's Einstein says "No discarding, no dismantling. We will transcend the division between the old and the new." In the script and in reality, Gullstrand states his objection to relativity as its natural grounding in 'speculative' theory, rather than experimental observation. However, outside observation of the sun's bending of starlight taken during a solar eclipse in 1919 - widely taken as proof of Einstein's theory - was still met with stubborn resistance from the ophthalmologist. In 1920, the prize was awarded to Charles Edouard Guillame 'in recognition of the service he has rendered to precision measurements in Physics by his discovery of anomalies in nickel steel alloys,' to which announcement Einstein gets the aside "Have you ever heard of him? Me neither." The snubbing continued in 1921, in which no Nobel Prize in Physics was awarded. Gullstrand finally caved in 1922 to the demands of Oseen and the other committee members, awarding the 1921 prize in that year to Einstein, but not to relativity. As a Jewish Czechoslovakian writing in German, Franz Kafka was a man of conflicted identity (and an utterly Kafkaesque legal battle over the ownership of his original manuscripts is still ongoing). Friedman's play is rife with in-jokes about the Kafka and his work – among others, he tells Einstein the Germans regard the Jewish population as 'vermin,' has a persistent cough when reading a first draft of The Trial, mentions a letter being addressed to an academy, and he parallels Einstein's disdain at repeated Nobel snubbings to a character he's writing who unsuccessfully 'feels compelled to gain entrance to a castle, to make a home there.' Throughout, he acts as a foil to physicist, as the latter rises to worldwide fame and Nobel Laureate status while Kafka toils away in obscurity and slowly succumbs to tuberculosis. The exchanges between Kafka and Einstein are some of the play's highlights, particularly the allusions, which include The Metamorphosis, The Trial, The Castle, A Report to an Academy, The Judgment, and even Deleuze and Guattari's seminal essay Kafka: Towards a Minor Literature. While the dialogue is imagined, Friedman works within the framework of fact for his play - Kafka and Einstein notably met in Prague in 1912, and were both in Berlin in 1914 and 1923. The play is at its strongest when we get to witness the verbal sparring - and emergent camaraderie - between the two Jewish intellectuals, especially over Kafka's embrace of his religious identity versus Einstein's struggle regarding it in light of his emerging views of the universe. "I begin with observation and raw data," Kafka says. "All the mysteries of my unhappy family. The emptiness of life as a minor functionary in a dysfunctional imperial bureaucracy. All the threats, confusion and fears of being a Jew in Prague. These are touchstones to analyze, to understand more universally so-called modern man. How can I render this universe objectively?" "I do not begin with data," Einstein replies, "but with a postulate, an insightful secure choice, then I deduce consequences, not all of which seem to make sense in our daily reality. " "The velocity light must be the same for observers regardless of relative motion," Kafka exhorts. "You told us that. But tell me, Dr. Einstein, what would be the moral equivalent of this universal constant?" Friedman's script is still undergoing revision before its November premiere. "What we have so far is the play without a lot of physics that I do want to inject into it, without harming the drama," he said. And while the physics is what made all of this possible, it's the drama - and Friedman's excellently crafted characters - that will make this play shimmer in Berlin come November. What I was told about Einstein's Nobel prize is different. It could be that Hendrix Antoon Lorentz would have sent a letter to the Nobel comity stating "Henri Poincaré discovered relativity and published about this discovery in 1904." True. And Poincare is now largely forgotten. Relativity theory was not originally ascribed entirely to Einstein as it is now. And the formula E=MC2 was penned by an Italian intellectual before Einstein. Read the online review of Schafly's book "How Einstein Ruined Physics".